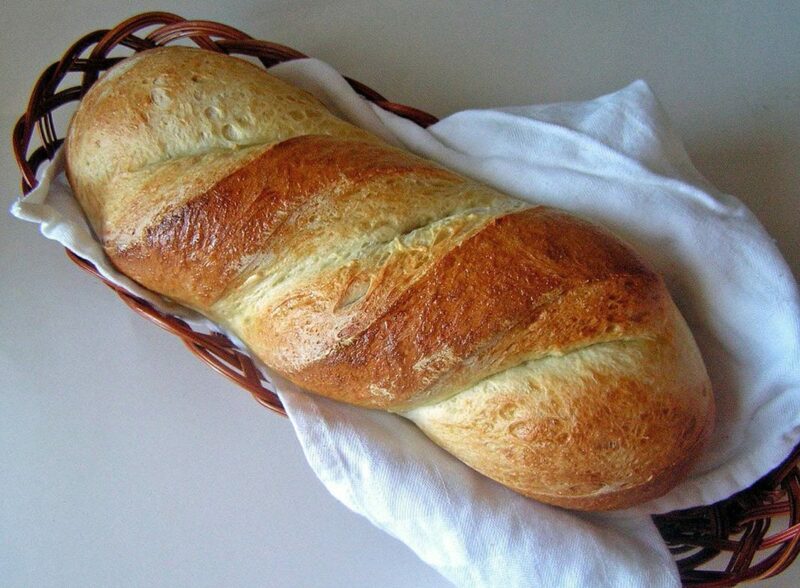 French Bread made with simple ingredients at home! In under 2 hours you’ll have 2 large loaves of delicious homemade French Bread. Try it! French Bread made from scratch is insanely delicious. I’d say serve it alongside something wonderful for dinner, but this bread deserves to be the main course it’s so good. I always get a little excited when I try a new bread recipe. I know, I’m a food geek, but it’s true! I wandered my way over to a food blog called Jamie Cooks It Up! and was mesmerized by her so-called Fabulous French Bread. Hmmm…fabulous you say? I’ve been on the hunt for a wonderful recipe for French bread. To date, I’ve tried 5 different recipes and each was delicious, but…something was missing. French Bread recipes are simple by nature, but each seemed to be more work for no more added yumminess in the final product. But I have to say, this recipe truly is fabulous. Try it! Read the instructions a couple times before starting. There are several steps, but they’re not difficult and just require a little focus, especially when you’re making it for the first time. Start to finish it took me just under 2 hours to have these beautiful loaves. Amazing! Place the 1 cup hot water in the microwave for 3 minutes to get it boiling. Dissolve the yeast into the warm water. Stir it around until it is all mixed. Pour the boiling water over the shortening mixture. Mix slightly to combine. Pour the cold water in next. Then pour the warm water and yeast into the mixer. Begin to add the flour, one cup at a time, until the dough pulls away from the side of your mixer. Add the dough enhancer at this time, along with the flour. The dough should be balmy but not sticky. Let the dough mix on high for 8 minutes. Separate the dough into three parts and place on a large jelly roll pan sprayed with cooking spray. Let the dough sit for about 5 minutes. Letting it sit will make it MUCH easier to shape. Spread the dough out with your hands. Stretch it slightly until you have an oval about 1″ in thickness. Roll the dough up into a log shape. Take the ends of the log and fold them into the middle, with the ends touching. Turn the loaf seam-side down onto a greased pan. I used my french bread pans, but you could also use a jelly roll pan. Repeat with remaining dough. Using a sharp knife, quickly cut 3 diagonal slits into the top of each loaf. Whisk egg until frothy. Cover loaves with egg wash, making sure to get in each slit. Place the loaves in a warm 170 degree oven and let rise for about 15 minutes. Turn the oven down to 350 degrees and turn the pan around in the oven. Bake for another 10-12 minutes, until the loaves are a nice golden brown. French Bread made with simple ingredients at home! In under 2 hours you'll have 2 large loaves of delicious homemade French Bread. Try it! Spread the dough out with your hands. Stretch it slightly until you have an oval about 1" in thickness. Roll the dough up into a log shape. Take the ends of the log and fold them into the middle, with the ends touching. Turn the loaf seam-side down onto a greased pan. I used my french bread pans, but you could also use a jelly roll pan. Repeat with remaining dough. Also- Don’t be intimidated by all the steps! I simply wanted to break the recipe down and make it easier to follow. Like I said, read it over a couple times, print it out and have it right by you in the kitchen. It really is easy! Hi! I just found your site and am loving it! For this french bread, do you reset the timer for an additional 15 minutes at the same time you turn the temp up to 450°, or do you reset it once it hits 450°? Thanks! Hi! Ok, so here&#39;s what I do: put bread in an already preheated 170 degree oven for 15 minutes. When that beeps, I increase the temp to 400 and re-set the timer for another 15 minutes, so it&#39;s not in there an entire 15 minutes at 400. Down to 350 for 10 minutes- I do the same thing. Does that make sense? I hope so. It&#39;s really easy bread! I wrote this down from the original site where it was posted, then my device broke. The girl came up with that rolling trick —makes all the difference—and I was looking for her tonight but don’t remember her name. Can you link to her and credit her? Step 10 says to divide dough into 3 portion which made me think there were 3 loaves. It appears it is a 2 loaf recipe though. What have I misinterpreted. Thanks!